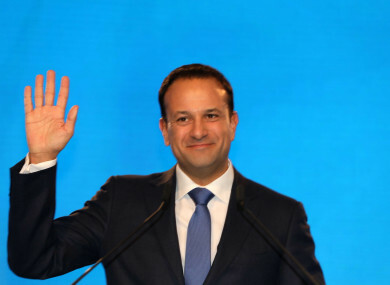 Leo Varadkar at the Fine Gael National Conference in 2017. ‘LET’S TAKE IRELAND forward together’ – that is the theme of Fine Gael’s National Spring conference, which kicks off in Wexford today. Fine Gael loves a tagline. Remember the ‘Republic of Opportunity?’ And no one can forget the ‘Keep the Recovery Going’ line. That one came back to bite them in the end. But party sources believe the real theme of this year’s national conference is the “importance of the female voice across all political levels”, which is why there will be a sea of Fine Gael women at White’s Hotel this weekend who are running in local and European elections. This year’s conference is all about highlighting the party candidates for the local, European and (perhaps not that far off) general election, with candidates like veteran TD and former Justice Minister Frances Fitzgerald, as well as former Rose of Tralee winner, Maria Walsh, making appearances across the schedule. The party is keen to highlight that four of the seven European election candidates it is running are women, while so far, Fine Gael has 109 women booked in for the local elections – the highest number achieved by any party, according to a spokesperson. They added that no party has ever exceeded 100, and the latest figure puts them on 28% representation. The party expects to reach the 30% quota for female candidates. There will be no member votes at this event, just seminars and debates on issues such as ‘prioritising women’s health’, as well as ‘protecting children on and offline’. Other discussions will be held on the party’s rules in relation to dispute resolutions. At the Fine Gael Ard Fheis in November, Gerry O’Connell, chairman of the national executive, said the rule change would allow the party to avoid litigation in the courts and ensure there are “better standards of due process whereby investigations of disputes and adjudication on disputes are separated”. The party members were told that the new disciplinary rules would put Fine Gael in line with the disciplinary system operated by the GAA. This year, Leo Varadkar will return to the tradition of giving his speech on Saturday night, and it will be televised. In his first Fine Gael conference as party leader in 2017, the Taoiseach delivered his speech at the opening of events due to the scheduled Saturday speech clashing with the Ireland versus Denmark football game. Two years ago, he promised to reduce taxes for middle-income earners by raising the standard cut-off point. He hit out at “critics and cynics” who claimed the housing crisis would not be solved. (Varadkar has since said he understands why people might be skeptical that Fine Gael can solve the homeless crisis). “I don’t believe them. Yes, there are major challenges with housing and homelessness, and no, they won’t be solved overnight. But we have a plan, the plan is working, and we won’t stop until we succeed. Because we believe that everyone should have a home. And we believe that every working person should be able to aspire to own one,” he said. At the time, the latest figures showed that there were 5,250 adults and 3,124 children staying in emergency accommodation – giving a total of 8,374. The homeless emergency accommodation figures for January 2019 show that there are now a combined total of 9,987 people homeless and living in emergency accommodation in Ireland, a significant rise of 234 people from December. The mention of the crisis in 2017 did little to appease Fr Peter McVerry who tweeted his astonishment that homelessness did not feature on the conference’s agenda. The Taoiseach later caused a media whirlwind when he told TheJournal.ie that Ireland has one of the lowest levels of homelessness. This will be attended by Housing Minister Eoghan Murphy and Rural and Community Development Minister Michael Ring, so the issue of homelessness surely will arise. While local and European elections might be the focus of the conference this year, the elephant in the room is the threat of a general election this year. Fine Gael and Fianna Fáil agreed to extending the confidence and supply deal, with leaders of both parties committing to a 2020 election date. But the Taoiseach has acknowledged since that no one knows what is around the corner, or who (or what) might bring this government down. This weekend’s conference will be about showing that Fine Gael is election ready. So expect big promises, talk of tax cuts and more money in your pockets. One problem for Varadkar making such promises is that no one knows what Brexit might bring for the Irish economy. Varadkar has said at previous party conferences he was told to shut up and keep his head down. Rather than being quiet, this year, the Taoiseach will be keen to make some subtle, and some not-so-subtle election promises. Email “Expect some not-so-subtle election promises as Fine Gaelers land in Wexford”. Feedback on “Expect some not-so-subtle election promises as Fine Gaelers land in Wexford”.